Ahoy! I’m back and it’s back to work time for me, which means it’s a Monday, which also means Geekly Review time! So, where have I been? What have I been doing? Well I guess I need to take you back to Christmas. I had a great Christmas, I bought myself and Xbox One (more on that later this week! ), I got loads of new comics/ graphic novels to read through. I ate loads of lovely food, and drank just enough to keep very merry throughout! But probably most shocking of all…. I only bought 1 game in the Steam winter sale…. Yup, ONE! And it was rubbish, so rubbish, I’m not even going to talk about it. What else have I been up to? Well I went away for New Year this year. Me, my girlfriend and another couple went down to St Ives for the week. If you don’t know, St Ives is a little town on the coast of Cornwall. And it’s a bit of a party destination for NYE. Everyone does fancy dress down there. And I mean EVERYONE! About 2000 people were there, and it all just turns in to one massive fancy dress street party. Our NYE set up, DJing on an ironing board! We had an awesome time, and it was a great way to see in the new year. Everyone was really friendly, and in a great mood. The only down side was the rain hammering down right on the stroke of midnight, which put a slight dampener on the fireworks display, but it was still pretty epic. We also had loads of great food down there, from burgers, and bbq, to steak and fresh fish. Oh and of course a Cornish pasty or two. Whilst away in St Ives, I managed to make a start on some of my new reading material. I started with Saga. I got volumes 1 & 2 for Christmas. 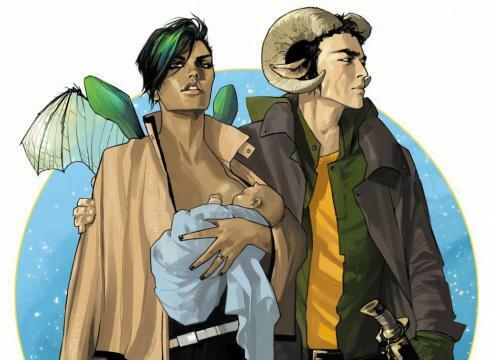 Saga is about an unlikely couple, Alana and Marko, from two warring races, falling in love, bearing a daughter (who also narrates to story), and trying to escape the multitude of people chasing them across galaxies. Now I must say, it’s brilliant! I couldn’t stop reading it, and so badly want to go out and get all the other issues. Its epic, the story is vast, the characters are brilliant. I just don’t have a bad thing to say about it. The imagination used in the world that has been created is truly wonderful. Creating living spaceships. Weird and wonderful alien races. Fascinating locations. And an intriguing magic system. As I mentioned earlier, I also got my hands on an Xbox One, I won’t about it too much right now, as I want to write up about it separately. I will say however, that I’m very happy with it so far. Well here we are… 2014. I welcomed 2014 in with a house party. 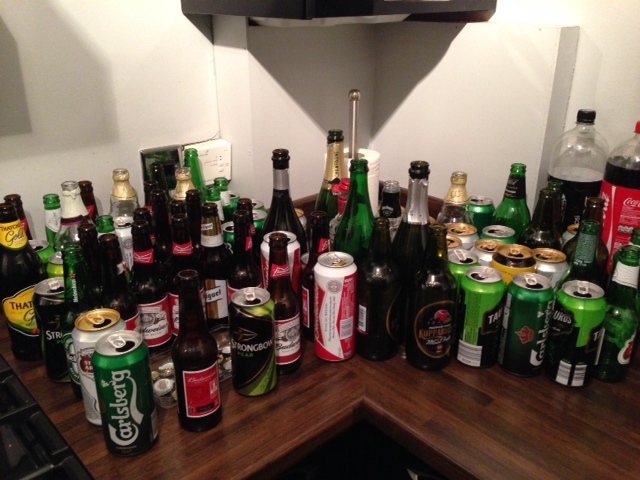 Fortunately this year my house remained in a some what decent state at the end of the party. So that’s always a plus. And actually didn’t suffer too badly the next day which was also a pleasant surprise. As for the weekend, Well Friday I bought Battlefield 4 for PS4 and ordered WWE2k14 which will be arriving within a few days. I didn’t get a chance to play BF4 on the Friday due to attending some one’s bon voyage party as they go travelling for a year. Bonus in that it cost me about £4.50 to get drunk due to left over beer from New Year and going to the car to fill our pints up with that left over beer. Cheeky but cheaper. After the party GSRR’s number one fan invited me back to his place to watch my team the New York Knicks against Will’s team the Houston Rockets. Unfortunately the game didn’t go the way I’d like with the Knicks falling short by a single point. Can’t fault Harden though for the Rockets. He had a stunning game. Saturday was spent playing the campaign on BF4. Now traditionally I’ve always played BF or COD on Xbox360 over PS3, So i was a little concerned just how i’d cope with the Duel Shock controller. I’m happy to report that there was no need for concern. I’ve managed to make the transition from Xbox to PlayStation with ease. After busting a few missions out on that I dived back into NBA2k14 (still not bored of this yet) and earned a few more trophies and played some more of my career. And lastly I went back onto Tomb Raider a little more. I feel so damn bad for Lara, the amount of punishment she takes is unreal in this game. There are points where I reach a camp area and just want to leave her there for her own safety, just to give her a break. Sunday there was some more NBA playing, but it was mainly spent watching Sport. I got the privilege of watching Manchester United lose again, but on this occasion being knocked out of the FA Cup. This was followed up by the NFL Wild Card Weekend. Well it’s back to work after an awesome few weeks off, I’m already looking to plan my holidays and flex days around upcoming sporting and gaming events. Here’s hoping I’m first to do so.